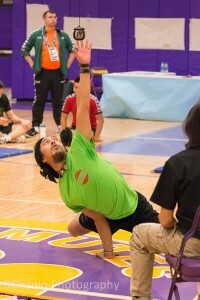 Native games (Arctic Sport and Dene Games) are an integral part, and unique feature of the Arctic Winter Games. These events are representative of centuries-old traditions and activities of the Inuit and Interior Native (Dene) cultures that are located throughout the north. Dene Games consist of five contests including events such as: the finger pull, pole push, stick pull, snow snake and hand games. Each represent either a test of strength or strategy. Arctic Sports, officially introduced to the Games in 1974 consist of eleven events including; the one-foot, two-foot, and Alaska high kicks; the arm pull, kneel jump, one-hand reach, airplane, head pull, knuckle hop, sledge jump and triple jump. Each of these sports have their roots in skills required for success in hunting and/or fishing activities and each involve some combination of strength, technique, and conditioning.